To Chill or Not to Chill Your Foods? The refrigerator is a great place to store foods. But do you know which foods should not be refrigerated? Which always should? When should you refrigerate foods? And how long do foods stay safe and fresh in the refrigerator? 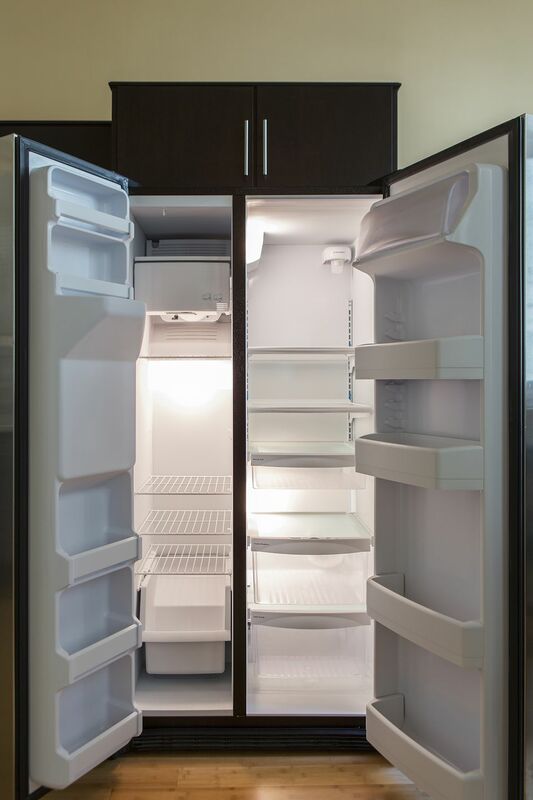 Your refrigerator should be set to a temperature of 40 F or below to 32 F. This is low enough to help slow enzymatic processes and the growth of bacteria, but not cold enough to affect food quality by allowing ice crystals to develop. It's a good idea to keep a refrigerator thermometer in the fridge to make sure the temperature is low enough for food safety. Always cover food in your refrigerator. The air inside your fridge is extremely dry and foods will quickly dry out, lose quality, and become unappetizing in a short period of time if not covered. Covering foods also prevents bland or delicate foods (like dairy products) from acquiring odors from other foods (like cabbage). The cool temperatures in the refrigerator slow down the process of enzymes in the food and slow down bacteria reproduction. This prolongs food quality, taste, and texture, and keeps food safer longer. Refrigeration does not kill bacteria and cannot improve food quality. Don't be afraid to put hot foods in the refrigerator. The appliance is made to cool down foods. The chilling process will happen more quickly in the fridge, once again giving bacteria less time to grow in the temperature danger zone of 40 to 140 F. If you have a large casserole or dish that needs to be chilled, separate the foods into smaller, shallow (no more than 3" deep), individual containers for faster cooling. It can take a pot full of hot chicken soup 24 hours to cool to a safe temperature in the refrigerator! Divide and conquer bacteria! Don't overload the refrigerator. There should be enough space between foods that air can freely circulate around them. This way the temperature will be more even throughout the appliance. Use your refrigerator thermometer to check the temperature of the crispers and shelves. The coldest part of your fridge is not the place to store fragile foods like lettuces and delicate fruits. In our refrigerator, the top shelf is the coldest spot; lettuces develop ice crystals there, so we make sure to store them on a lower shelf. Foods that need refrigeration should be placed in the refrigerator within 2 hours after eating to help prevent bacteria growth. If the ambient temperature is more than 80 F, that time safety zone shrinks to 1 hour. Don't violate this rule!!! At least once every three weeks, remove everything from your refrigerator. Working quickly (remember the 2-hour rule! ), wipe down all the interior surfaces with a baking soda solution. Dry thoroughly. Pay attention to the seals and gaskets too. We used to turn off our fridge while cleaning, but now we just let it stay on so it reaches the recommended temperature more quickly after refilling. The fact that our food is still safe and good quality more than compensate for the amount of power we may waste. Luncheon meats: Unopened packages can be stored in the fridge until the date stamped on the package. If opened, these products should be eaten within five days. Milk: Fresh milk should always be stored in the fridge. Eggs: Do not store eggs in the refrigerator door because the temperature there is not cold enough to keep the eggs safe. Be very careful to follow use-by dates stamped on pasteurized eggs and egg products. Cheese: All cheeses should be tightly wrapped and refrigerated. Fresh meats including seafood: Fresh meats must be refrigerated immediately when brought home from the store. Wrap the package in additional plastic wrap or place in plastic bag. Make sure you don't place raw meats above any foods that will be eaten uncooked, to prevent juices from the meats from dripping on other foods. Fresh whole meat should be used within 3 to 5 days. Fresh ground meat should be used within 1 to 2 days. Bacon and sausage: Refrigerate the unopened package as well as the opened package. The newer forms of shelf-stable bacon can be stored in the pantry before opening. Canned ham: Most canned hams can be stored before opening in the pantry. Read the label carefully and follow directions. Marinating foods: Always, when marinating foods, store in the refrigerator to prevent bacterial growth. Defrosting foods: Always defrost perishable foods such as casseroles, meats, poultry, and seafood in the fridge. Never defrost at room temperature. Fruits: Wrap well and refrigerate. Don't wash them before storing or they will be more prone to mold. Vegetables: All vegetables should be stored in the fridge except for potatoes and onions. Doughs: Any dough product should be stored in the refrigerator. Keep tube doughs in the fridge until just before using; otherwise, they will soften too much. Baked products containing cream or custard fillings: These products include cakes, pies, bread, coffee cakes, and cookies. Wrap well and store in the fridge. Butter: Refrigerate in original packaging. Some say you can store butter at room temperature; it's your choice. Leafy greens: Store them in plastic bags in the fridge. Any canned or jarred or packaged food that has on its label "refrigerate after opening" should be, well, refrigerated after opening. Potatoes and sweet potatoes: When potatoes are chilled, the starches in the flesh change to sugars. This will make the potatoes taste sweet when cooked. Make sure to keep potatoes and onions separate when stored. Canned Parmesan cheese: If you buy the finely grated Parmesan cheese in the green can, take a look at the label. It says do not refrigerate - even after opening! Honey: Honey will thicken and crystallize if stored in the refrigerator, even after opening. If this does happen, you can place the opened jar of honey in a pan of hot water and it will return to a pourable, smooth texture. Oils except for nut oils: Most oils will thicken and turn cloudy if stored in the refrigerator. The exception is nut oils, which can turn rancid very quickly and should be stored chilled. Baked cookies: Do not refrigerate cookies unless they contain a cream or custard filling. They will go stale much faster and lose quality quickly if stored in the refrigerator. Peanut butter: Read the label on the peanut butter you buy. Some fresh, organic brands do require refrigeration. But most ordinary peanut butter should be stored, tightly covered, in the pantry, even after opening. Tomatoes: Tomatoes do not like cold temperatures. You can store them in the refrigerator, but the cell structure will break down, resulting in an unpleasant mushy texture. Bread: The starch in bread will change structure under refrigeration (called retrogradation), making the bread texture tougher. Bread also lose moisture faster in the dry refrigerator environment. Do not refrigerate bread until the label says to. Chocolate: When chocolate is kept too cold and is then brought to room temperature, condensation can make sugar condense on the top of the product, forming a rough surface called sugar bloom. Unless directed on the label, store chocolate, tightly wrapped, in a cool cupboard. Onions: Do not store onions in the refrigerator. They should be stored in an open container in a cool, dry place - away from potatoes because they each emit a gas that makes both of them mold and rots more quickly! Now let's learn about freezing. First, it's important to learn tips on how to freeze foods. To successfully freeze foods, there are some simple rules you need to follow. The two most important bits of advice is to make sure you wrap the foods very well, and that you keep careful track of what is in your freezer. Freezer burn is dehydration of the food caused by improper packing, and wastes food; it's caused by evaporation when food isn't wrapped well. And if you don't label the foods in your freezer and have a frequently updated chart of what's in there, your freezer will be impenetrable in a very short time - which also wastes food. Always freeze frozen foods that you intend to store for more than a few days. Follow expiration dates for best quality. Unless you plan to use them right away, keep products that you buy frozen in your freezer. When shopping, put frozen foods in the shopping cart last and unpack them first when you get home. Always immediately put frozen foods into the freezer. Your freezer temperature should be below 0°F. Use a thermometer to check the temperature. Use microwave-safe plastic wrap if you plan to thaw or cook the frozen food in the microwave. Freeze foods in smaller portions so the food cools faster and thaws faster for best quality. Freeze in thin portions. Remember that freezing will not improve foods, it will just keep them at their original freshness and quality. Freeze only top quality foods. Freeze frozen pasta, meats, breakfast items, frozen juices, frozen pizzas, and frozen poultry and seafood. Keep those items in the freezer until you are ready to use or cook them. You can freeze ingredients for a casserole in individual packets (chicken, vegetables, cheese), then place the smaller packets into one large bag. Label well, including thawing and baking instructions, then freeze. Line casserole dishes with heavy duty foil before assembling. Fill casserole, freeze, then remove foil-wrapped food and seal in​ ziplock heavy-duty freezer bag. Place in original container to thaw and bake. If you want to preserve meats longer than a few days, they must be frozen. Wrap securely in freezer wrap, seal, label, and freeze up to three months. To freeze fruits: To freeze small fruits such as raspberries and blueberries, place on a cookie sheet in a single layer. Freeze until firm, then pack in hard freezer containers. To freeze larger fruits, you can puree them or chop them. Freeze in a single layer or in a hard-sided container. To freeze vegetables: Most vegetables benefit from blanching before freezing. Drop the cleaned vegetables into boiling water for about 10 to 30 seconds to set the color. Plunge into ice water, then dry and freeze individually as you do fruits. Pack into hard-sided containers. Delicate vegetables: Lettuce, tomatoes, radishes, and cucumbers do not freeze well because their cell structure breaks down. You can freeze fresh tomatoes, but then only use them in cooked dishes like tomato or spaghetti sauce. Fruits: Watermelon, grapes, apples, and citrus fruits do not freeze well. Generally, any fruit with a high water content loses quality when frozen. You can freeze blueberries, raspberries, strawberries, peaches, and nectarines. Cooked egg whites: Cooked egg whites become rubbery when frozen. You can freeze them in a salad or sandwich filling if finely chopped and mixed with other ingredients. Mayonnaise: Mayonnaise separates when frozen. In a casserole, mayonnaise can freeze well. Use cooked salad dressings instead of mayonnaise. Potatoes: Cooked and raw potatoes become mushy when frozen. Use purchased frozen potato wedges, chunks, or hash browns when making a casserole to be frozen. Flour-thickened sauces: These sauces and gravies separate when thawed. Freeze without the thickening agent, then add flour when reheating. Cornstarch-thickened sauces: These sauces and gravies thickened with cornstarch separate when thawed. Freeze without the thickening agent, then add cornstarch when reheating. Cream and custard pie fillings: These foods tend to separate and 'weep' (moisture appears on the surface) when frozen. Cooked frostings: Cooked frostings, like Seven Minute Icing, become rubbery and tough when frozen. Cooked pasta: If you want to freeze cooked pasta, mix it with a sauce or gravy before freezing. Plain cooked pasta becomes too mushy if frozen alone. Salad greens: The cell structure of salad greens is destroyed when frozen; do not freeze. Cream cheese: Cream cheese becomes crumbly and grainy when frozen by itself. It will freeze well when mixed with other ingredients, like milk or cream, in a sauce.